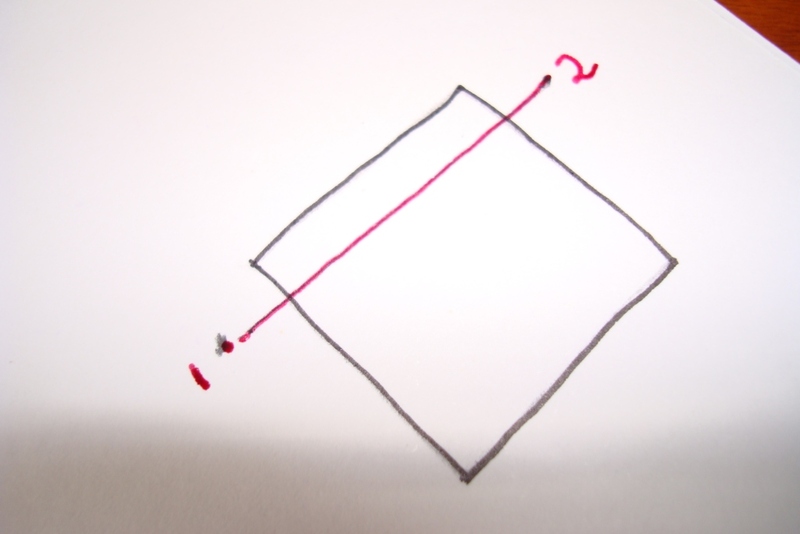 Though there are wonderful tutorials for basic square,I am starting my tutorial with this , because kutch embroidery starts with this square. In this tutorial I am dealing with the curved square. 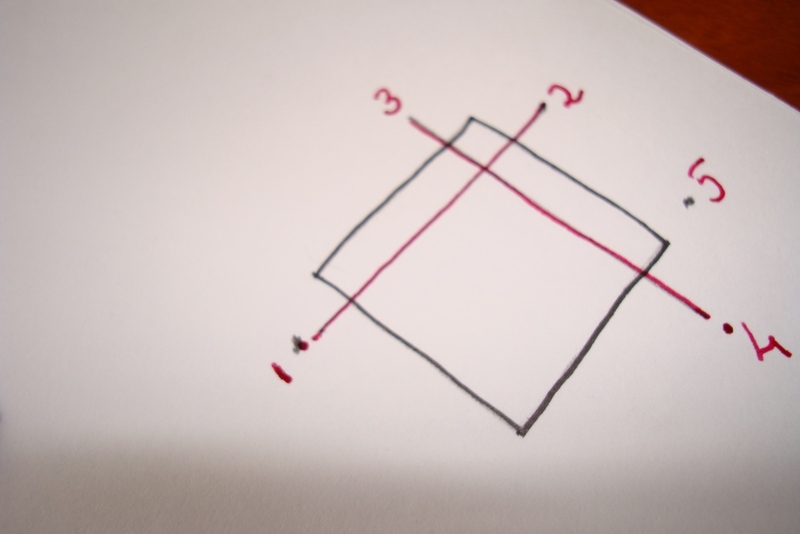 1. the thickness of the thread depends on the size of the basic square. 2. 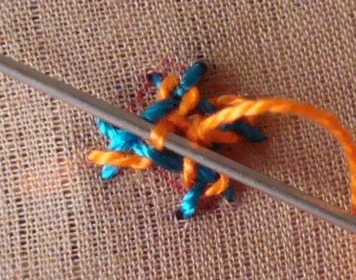 After the pattern is filled with the stitch, the cloth on which it is done should not be seen. 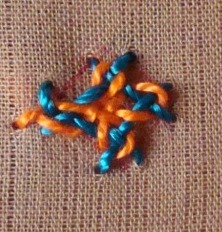 The thread weaving should cover the whole pattern. 3. Important- the thread path- the thread always goes up and down alternatively, this keeps the embroidery intact.looks attractive also. If there are mistakes, it is visible to the eye, and the finished look is not good. 4. take time to draw the design as perfect and neat as possible, otherwise it is difficult to – move around- and simultaneously rectify the original design. 5. practice a lot. understanding is better that way. I have drawn the pattern big, and used pearl cotton for showing the details only. Start with taking the needle out at ‘1’ and move across and insert it at ‘2’. This thread is parellel to the line of the pattern. Take the needle out at an angle at ‘3’. 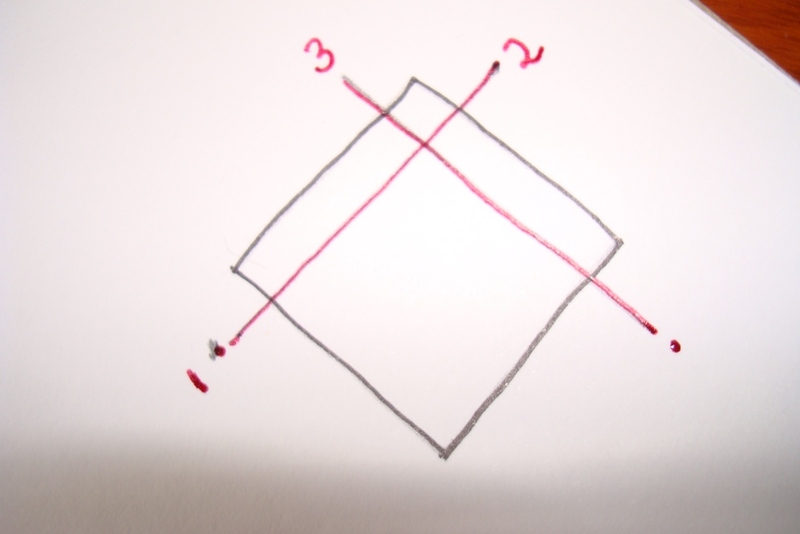 This angle is based on the second line[‘3’ –‘4’] being perpendicular to first line[‘1’-‘2’]. From’3’ go over to the next corner and insert the needle at ‘4’. The second line goes over the first line at the intersection. 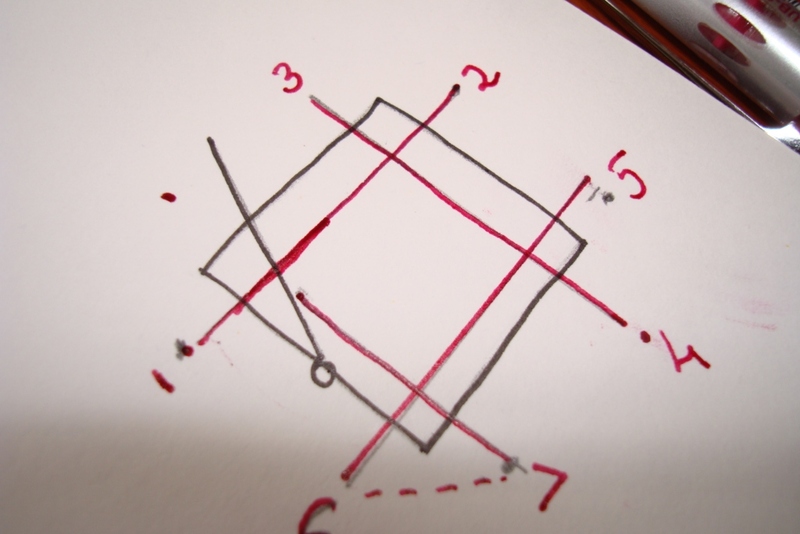 4th and last line- take the needle out at ‘7’ and go over the third line[‘5’-‘6’] at right angle. Important – now go under the first line[‘1’- ‘2’] and insert the needle at ‘8’. At this point the lines are all going over and under alternatively. I have a taken a different colour thread to show the working. Take the needle out a t a point- between ‘1’&’8’. Just as the foundation stitchm, this journey is also from left to right. At the same intersection the fourth line[‘7’-‘8’] is going below the first line[‘1’-‘2’]. Now the [I] thread goes above fourth line. Cross over to the next intersection and study it. The theory is – wherever the [F] thread is above[on top] the [I] thread goes over it.and wherever the [F] thread runs below[goes beneath] the [I] thread goes below it. On this basis the [I] thread is interlaced, lastly it crosses above the initial line also. Step -2 is repeated on the next intersection of the [F] thread. After interlacing around this corner, the [I] thread goes above the previous line and lastly crosses below the first line. Thus an interlaced inner square is completed. The [F] thread does not move, because it pierces the fabric. 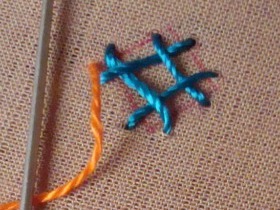 The [I] thread is directed to interlace over and under the [F] thread. This keeps it intact and in place.. 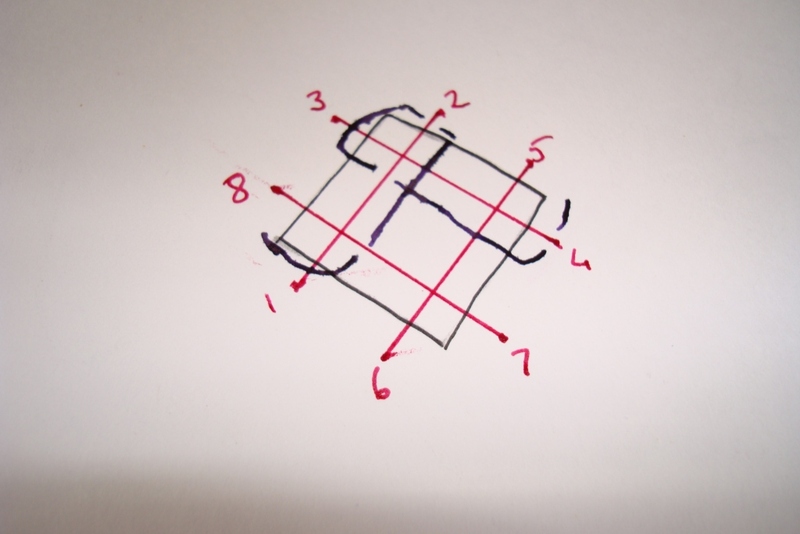 The square should be made as small as possible, otherwise the interlacing thread will have place to move inside the foundation stitch, this will distort the square. 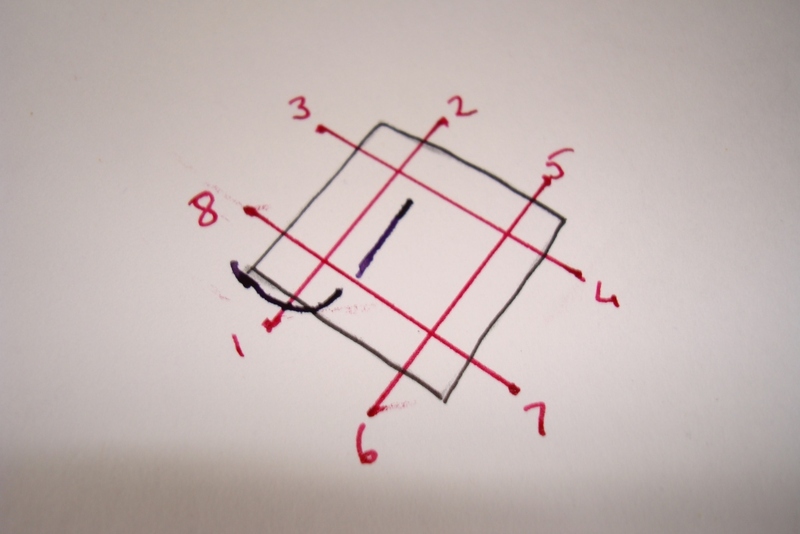 Practicing of this square is very important because, this is the basis for kutch embroidery. 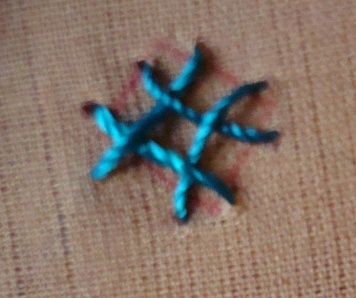 practice it over and over, till such a time ,when we are able to do this stitch without even trying! if there are any doubts to be cleared, if there are any tough spots on this tutorial anywhere, please do convey them. I ‘ll happy to wotk on them. Mirror tutorial was breeze compared to this.I may have overlooked certain important factors. I can try to improvise. Hope this tutorial is helpful.I ‘ll continue the tutorials with the other basic patterns , once I receive the feedback. it was of gr8 help!! This has been made very simple and easy to understand the stich. I am glad you are finding this useful. Hi Archana. Thank you. what specific stitches? Thank u. This tutorial is very easy to understand. I will definitely try this. Good to know that this tutorial is useful. 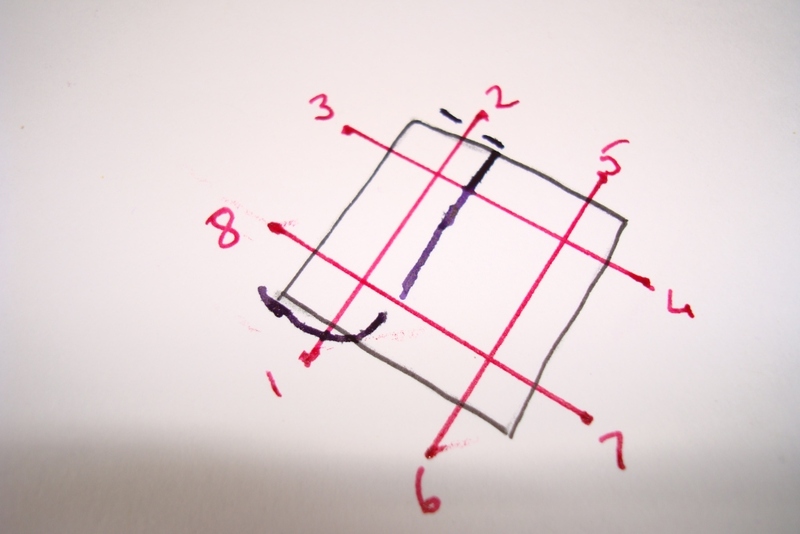 the ideal size of each individual square is .2 inch drawn on inch graph. this produces bold designs to be worked with 3 strands of cotton skein. 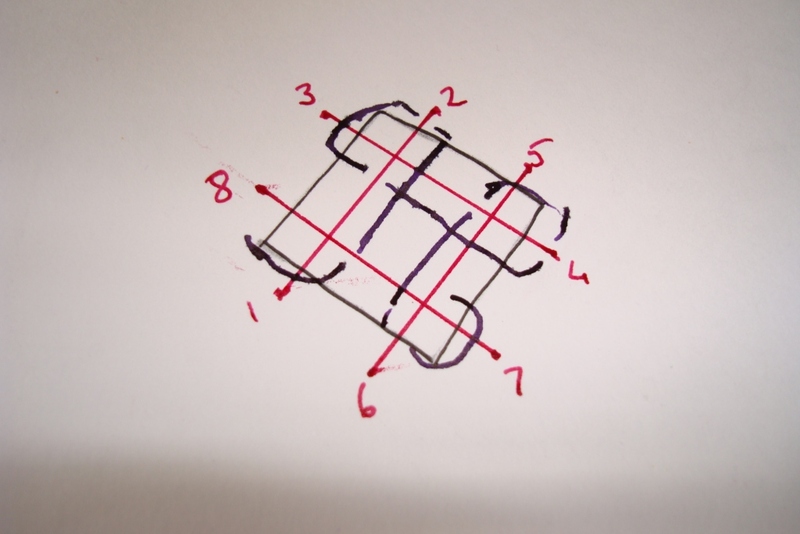 4 mm square produces more intricate designs. this can be worked with 2 strands of cotton skien. 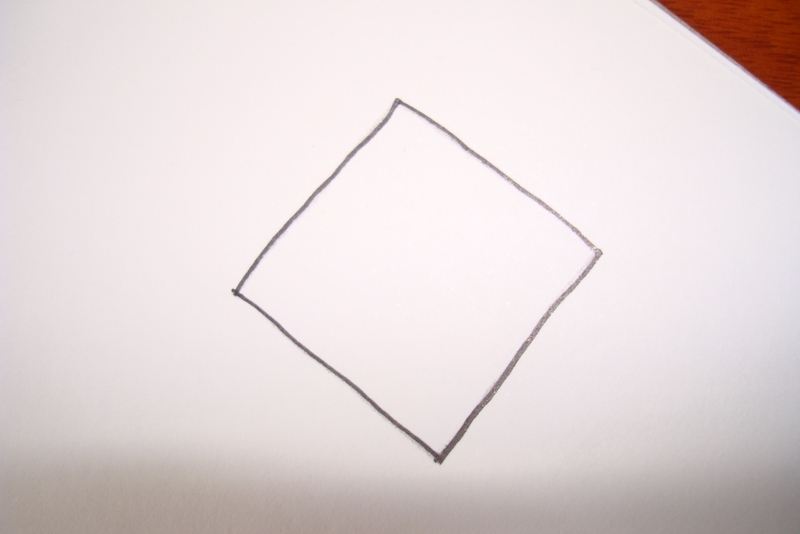 start drawing .2 inch square and move on to 4 mm square. Hope this was useful. Hi! I need you to guide me to do one particular kutch work that I’m having trouble with. please let me know your email that I can send motif image. Hi! Thanks for replying back. I have to send image of that motif I’m having trouble with, that’s why I’ll sending by email. Thanks. Hi Varsha, I did not receive your e mail. I have to see the motif. I can definitely try .